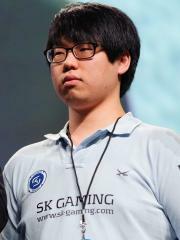 Jang "MC" Min Chul is one of the best performing Protoss players, with two GSL titles to his name. He is known for his various ceremonies after winning matches. He notably dressed up as a Murloc during 2011 MLG Providence Pro-Circuit and performed a ceremony for the crowd after a victory over Mvp. MC has also traveled outside of Korea several times, especially to Europe where he won the 2011 DreamHack Stockholm Invitational, Copenhagen Games Spring 2011, HomeStory Cup IV and IEM Season VI World Championship. On December 20, 2015 at HomeStory Cup XII, MC sung "Let it Go" from the Disney movie "Frozen" to celebrate the retirement of fellow StarCraft II player MMA. At this time, MC is ranked #163 in highest overall earnings, and #23 in highest earnings for players from Korea, Republic of. Out of the 115 tournaments awarding cash prizes that MC had competed in, the largest amount was $86,565.10 from GSL Open Season 3 on December 18, 2010. His 1st place finish makes up 16.98% of his total prize money won. On March 19, 2011, MC arrived at the $100,000 milestone, winning $44,462.23 and placing 1st at GSL March 2011 (Code S). Prize money from 8 tournaments got him to that point. In the last 90 days, MC has been awarded $2,813.90 in prize money from 2 tournaments, $2,688.90 (or 95.56%) of which came in the last month. MC has contributed to the competitive scene of the following games outside of competing in tournaments.